Home - Golden Sands - Build Contest! It's time for another build contest friends! In typical Golden Sands fashion, the prizes for this build contest will be epic! The theme? Minigame! Come up with a fun minigame that will be used regularly for our Sunday minigames event. 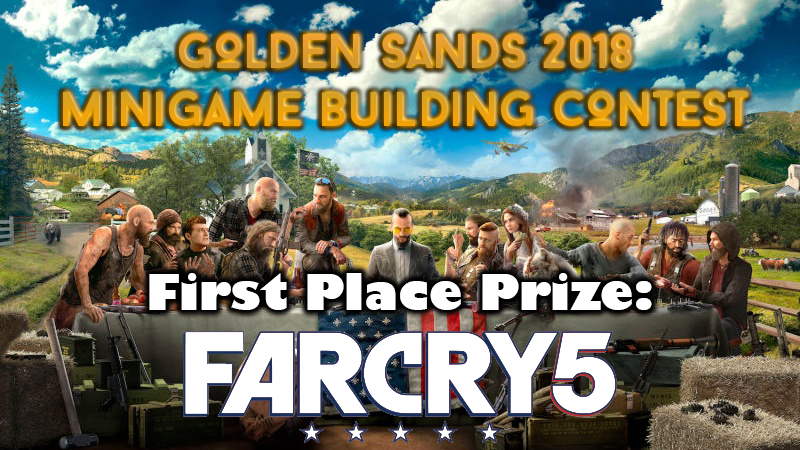 The build contest will run from March 5, 2018 through March 26, 2018 - just in time for the 1st place winner to enjoy the latest in the series: Farcry 5! The best part about this contest is that it's function over form! You just gotta make something that works, we can decorate it later, and even better? You can enter multiple times. Come up with two or three minigames for a greater chance to win! Stay tuned for more details about the contest rules on March 5th!